One of Britain's busiest shopping centres was the scene of a gypsy-style bare knuckle fight captured on camera as shoppers looked on. The pair began, what appears to be an illegally planned boxing bout in Manchester's Trafford Centre, while a friend filmed it on a mobile phone. YouTube footage, which has gone viral, shows shocked cinema-goers jumping for cover as the fight spilled towards them. A voice on the film is heard shouting 'Sing Danny Boy - Hit him' as the fight reaches its peak. Four uniformed security staff eventually break up the fight, and one of the pair is seen bleeding from a head wound. 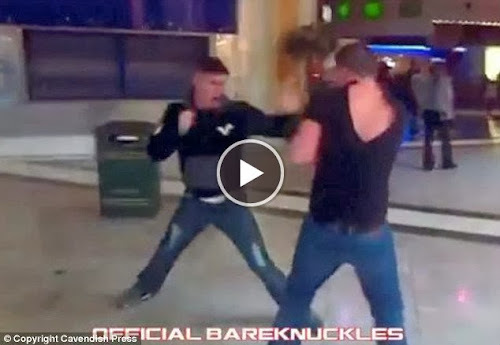 The footage was uploaded under the title Official Bareknuckles, and has been viewed 52,000 times. Fighting like this is is typical of a gypsy-style straightener, arranged to settle petty disputes. And this is not the first time that a fight of this kind has been filmed in Manchester. In 2011 Celebrity Big Brother winner Paddy Doherty, 52, had his ear bitten off in a bare-knuckle street brawl outside a PC World store. The fight was uploaded to YouTube and showed the star, who found fame on Big Fat Gypsy Weddings, grappling with his cousin Johnny Joyce, 21. Greater Manchester Police confirmed that they were called about the Trafford Centre incident, but is believed that no arrests were made. A spokesman for Intu, which owns the shopping centre, said: 'We do not tolerate any form of violence within the centre.